For those who do not know that what is appliqué embroidery and from where it originated, this word appliqué comes from the work “appliqué” which is a French word and means to apply. This technique started hundreds of years back all over the world when people fixed their ripped clothes and they sew over the piece of cloth over the ripped cloth. It is also known as patch work and is widely used to create bright and distinctive designs in quilts and in clothes. Skilled workers using embroidery machines need to focus on what is appliqué embroidery while doing their work on program based machines. The programs have difficulty and complication of two thread colors, which means the machine stops during stitching to allow the person to switch threads. Firstly, the fabric and the applique fabric are sewn into the machine’s embroidery hoop. A loose basting stitch over both layers of fabric is made by the machine. Then, the machine stops for a thread change, or other pre-programmed break. The person then slashes away the excess applique cloth from around the basting stitch. The machine continues on program, automatically sewing the satin stitches and any decorative stitching over the applique for good quality product. 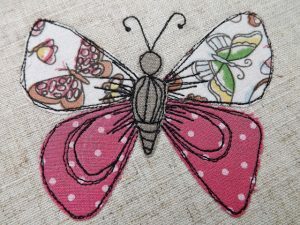 After reading this article it will now be cleared to people that what is applique embroidery?